Each year, hundreds of students from across the State have the opportunity to take part in the Oklahoma House of Representatives High School Page Program. Pages are assigned for one week, Monday through Thursday, during the legislative session that begins the first Monday in February through the last Friday in May. Serving as a Page includes working in the House chamber during daily session and also running errands for the Representatives and House staff and taking part in the House Page Mock Legislature. Pages begin their duties on Monday morning with an orientation session to become familiar with the Capitol building and their duties for the week. Each day begins at 8:00 a.m. and ends at 4:30 p.m. Monday thru Wednesday with the exception of Thursday, when Pages are released for the week at 2:30. Hotel accommodations and chaperones are provided for all students. Hotel Pages are bused to and from the Capitol daily. Pages are closely supervised at all times and are not permitted to leave the hotel or the Capitol. Wednesday mornings at 9:00 a.m., unless the House is in daily session, House Pages will participate in the “Pageville Mock Legislature.” The mock legislature is held in the House Chamber, 4th floor of the Capitol in the West wing. Pages elect their own officers and the House staff guides them through the legislative process. 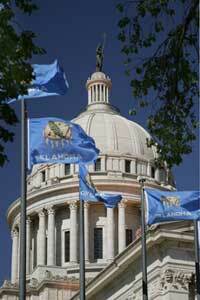 •	Being a Page for the Oklahoma House of Representatives is a high profile venue. Pages should observe a business professional dress code. •	Young ladies are encouraged to wear blouses with slacks, as the House chamber is kept cool, a sweater or light jacket may be needed. Comfortable shoes are a for a lot of walking. •	Young men are required to wear a dress shirt, tie and sport coat or suit. Comfortable shoes are recommended due to a lot of walking. The Page Program is open to high school sophomores, juniors and seniors. To request an application to serve as a House Page, contact your local state Representative’s office by calling the Oklahoma House of Representatives at (405) 521-2711 or by downloading the page request application form by clicking the link below. After filling out the form, save to your computer to be attached to the email you send to your Representative. After you are approved for the Page Program, you will need to download the forms below, fill out the forms and have your parent or guardian electronically sign them (Just Enter Name), then send as attachments to your Representative.